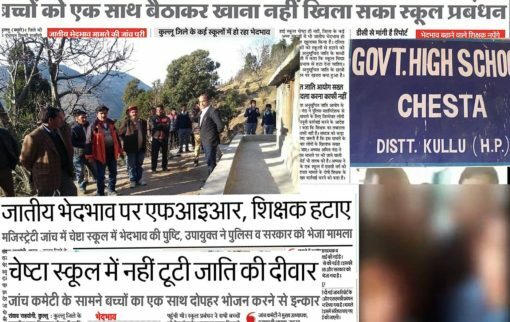 Dominant castes in the ‘Devbhoomi’ (Godland) of Himachal Pradesh continue to perpetrate atrocities on Dalits in the state at regular intervals. This, Himachal’s shame, is conveniently being swept under the carpet by mainstream political parties lest it upset upper caste voters, the more so as polls are near. These atrocities are not addressed at the social level, and instead of deterrent political interventions they are relegated to the status of breaks in law and order. The most recent case was reported from Kullu district last week, where a Dalit resident of Sainj village approached the police after being assaulted by a mob. He was forced to cough up a fine of Rs 5,100 just because a bouquet thrown by followers of a local deity fell into his lap at a religious congregation. A video of the assault on the victim and his friends at the Kartha fair in Thatibeed in the district’s Banjar area has gone viral. This is not an isolated case in Kullu. A few months back it was a conductor with the state-run Himachal Road Transport Corporation who reportedly had to pay a fine of Rs 10,000 because he reportedly entered an upper caste house in Khanipand village where the bus had halted for the night. Barely a year ago a government-run high school had segregated its Dalit students and told them to sit outside ‘in a place used for horses’ during the telecast of Prime Minister Narendra Modi’s ‘Pariksha Par Charcha’ (Thoughts on Education) programme. The most gruesome case pertains to the alleged murder of right to information activist Kedar Singh Jindan in Sirmaur district last September. Thereafter there was another instance of a Dalit youth allegedly thrashed to death in the Nerwa area of Shimla district, because he did not allow a vehicle carrying three upper caste men to pass through the town’s congested market. In all these cases the two mainstream parties, the Congress and the BJP, failed to come out and take a stand. It is only the Left that has been making noises, on party platforms or through its frontal organisations. But social activists want Himachal’s lone CPM legislator Rakesh Singha to be more vociferous in taking up these issues in the state assembly. It needs to be pointed out that with an approximately 28 percent Dalit population, Himachal stands second only to Punjab among Indian states in terms of the proportion of Schedule Caste residents to the whole. “In the absence of any deterrent coming from the government, treating these cases as law and order instances where the police registers cases and quite often compels the victims to compromise, serves no purpose. Till the time political parties take a stand, the government will not respond. It will react only when the leadership of the parties takes a stand,” observed a social activist who has been highlighting caste atrocities regularly, particularly in district of Sirmaur. The activist, who has been part of some landmark studies on the issue of caste in the area, pointed out that the feudal mindset prevailing in some parts adds to the problem. It was only last month that social activist from Kangra Sukhdev Vishwapremi underlined at a state-level meet that while there is a lot of talk about the Swachh Bharat Mission and Normal Panchayats, first it is the minds of the common man that need to be cleaned. Vishwapremi underlined at the meet that the Gram Sabhas have a mandate on social justice and they should act on it. The above mentioned instances are those that somehow managed to find space in the local media, mainly in the local pages which aren’t often circulated beyond the administrative boundaries of the district, or at the most the state. But the fact remains that casteism continues to be rampant, and people are discouraged from reporting it lest it sully the image of Himachal as ‘Devbhoomi’ peddled to the world outside. This correspondent has frequently interacted with Dalits who related how separate cremation grounds exist for the upper and lower castes, how upper caste children eat midday meals in schools cooked only by upper caste cooks, how Dalits still eat separately at weddings and other feasts, and how even the water sources are different in certain villages for different castes. In some parts caste Hindus won’t serve Dalits tea with milk or sugar, will provide separate utensils for their use, and in certain villages an unwritten code forbids them entry into certain temples. Social activists have been pointing that while there has been economic inclusion of Dalits as envisaged by the state’s first chief minister Y.S.Parmar, social inclusion remains a distant dream. This has led to a scenario where things continue to be accepted the way they are, as a way of life. Coming back to the recent episode in Kullu, the Dalit Shoshan Mukti Manch (Dalit Oppression Liberation Forum) plans to hold statewide protests on January 30 to highlight the continuing atrocities. He disclosed that the Akhil Bharatiya Kshatriya Mahasabha which has the tacit support of Hindutva organisations is trying to give the recent atrocity a fresh narrative, by linking it to last year’s Supreme Court order on safeguards on arrest under the Scheduled Castes/ Scheduled Tribes (Prevention of Atrocities) Act, which compelled the BJP-led government at the centre to restore the Act to its original form. It is learnt that the organisation plans to hold a demonstration in Kullu on Tuesday. Despite the poll season approaching, it is unlikely that the issue of caste atrocity will get prominence in the mainstream parties’ narrative. It will be used as an instrument to get votes only in hushed tones.